Technically, I'm a newbie to this site but I have owned a bandit and sv a cbr rr and gpz 550. 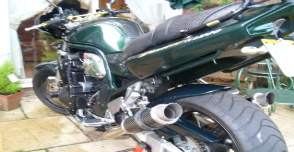 My question is that I am in the market for a suzuki bandit and have found a beautiful 2007 street fighter bike. It is black in great shape with 6K on it. He is asking 5500 for it and is not budging. Should I take the deal. I really like the bike a lot.